This is a natural bute replacement. Phytotherapy for inflammation, painful joints and muscles without the harmful side-effects to stomach, kidneys, bone marrow, appetite or joint fluid. Nature’s Herbal Alternative to Bute. Contains Devil’s Claw, Willow Bark, Meadowsweet, and Burdock Root. Phytotherapy for inflammation, painful joints and muscles without the harmful side-effects to stomach, kidneys, bone marrow, appetite or joint fluid. Nature’s Bute replacement. 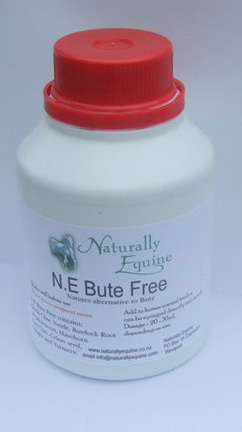 DOSE 10-25ml up to twice daily, depending on size of horse and severity of problem. Syringed directly into the horses mouth or added to feed. 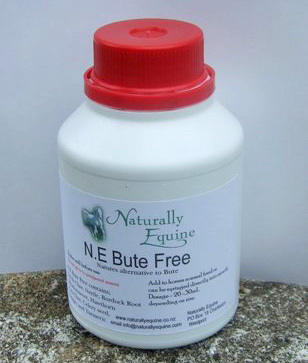 Can be used for both acutee and chronic conditions, as a preventative, or to relieve the horse from discomfort due to over exertion or injury. Devil’s Claw, also known as “Nature’s Bute” is well known for its ability to provide fast, powerful and reliable pain relief as well as anti-inflammatory and anti-spasmodic benefits. Devil’s Claw has been used to treat cases of arthritis where pain and inflammation need to be alleviated. It also has the ability to cleanse deep into tissue and muscle walls and supports liver function. Meadow sweet is traditionally used to help relieve inflammation and pain, particularly in arthritic or rheumatic conditions. Willow Bark yields salicylic acid, the precursor to aspirin, adding still more anti-inflammatory and analgesic qualities to this blend. Burdock Root is the fourth herb in this team. Burdock is one the best blood purifying herbs, and is excellent for ailments of coat and skin. It can help by reducing swelling around joints, making it an ideal herb to use in all types of arthritic conditions. Burdock will promote kidney function which helps to clear blood of harmful toxins.